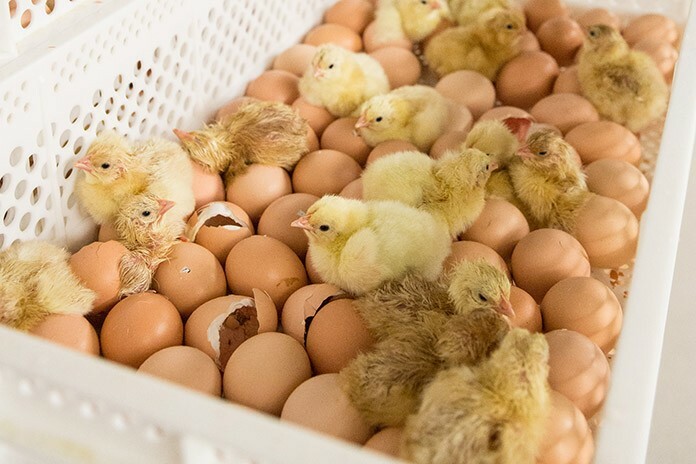 The evaluation of chick quality parameters provides important information on the whole production process and a proper investigation should be done in both the hatchery and the field. A chick quality monitoring or diagnostic program must be developed with the following in perspective: all incubation systems provide overall good chick quality; in an egg mass, variations in embryo temperature occur not only in certain areas, but within individual egg flats and hatcher baskets. For this reason, an effective chick quality-monitoring program defines the small population of problem chicks that are going to the field. The evaluation should lead to correct diagnosis of incubator or hatcher involvement and the result of the monitoring should be graphed into an SPC type system so that problems can be noted and resolved. Results can vary by breeder flock age group. Therefore, evaluations should be graphed by breeder flock age group. The most common is a defects based approach. The second approach is based on chick length as an indicator of chick development. In this evaluation the only defect noted is the navel quality since it is determined late in incubation and chick size will not be appreciably impacted by problems in the hatcher. Both defects and chick size are used in a hatchery and field chick quality/mortality evaluation. Chick length reflects embryo temperature, which is linked with field performance. Chick length is positively correlated with yolk free body mass and it’s a good predictor of performance, especially to 21 days, and of field mortality. Chick length evaluations are practical and can be correlated by different people. In the past, the chick length parameter was used to measure the flock average. Now it is better used to determine the percentage of chicks that have poor development and will die in the field. The size of the normal chicks and chicks that are considered too small to survive is shown below. In the defect based chick quality evaluation it is difficult to categorize specific lesions to specific incubation problems since all environmental variations occur within an egg mass. It is also difficult to determine the normal percentage and the percentage that indicates a field problem. That said, generalities could be drawn for certain lesions and causes. Signs: large retained yolk, strings, diffuse red hocks, and yellow discoloration around the navel and leg deformities. Normal chick size. Fluid build-up under the skin at hatch. Causes: high relative humidity in the incubation environment, low embryo temperature, and high embryo temperature. Signs: membranes adhere to chick, poor feathering, short pale feathers, ectopic viscera chicks, red hocks, bad navel closure, small chick size, and urates in the eggs and on the chicks, large unabsorbed yolks. Egg debris is dirty with meconium and blood. Dehydrated chicks are small. Ascites at hatch. Fluid build-up under the skin at hatch. Causes: variations in airflow, variations in air temperature and high dry bulb set point. Signs: crust at the corners of the beak, panting, urates and pasty vent. Dehydrated chicks are normal sized. Causes: variations in airflow, variations in air temperature, and high dry bulb set point. Signs: slow hatching chicks with clean egg debris, chicks sit and do not stand properly, large retained yolks, red hocks, and bad navel closure. They are low weight loss chicks. Causes: variations in airflow, variations in air temperature, low dry bulb set point, excessive humidification spray. Incubation issues: chicks with incubation issues include all chicks with any signs of poor incubation. In general small chicks with large unabsorbed yolks are incubation related. Conditions after hatch in the hatcher, chick processing area, truck delivery, and early brooding. In general chick size is normal and yolk is utilized with problems after hatch. Small chicks with large yolks and/or with dehydration are incubation problems. The smaller the chick the earlier that the problem occurred in incubation. Any retained yolk is also a sign of incubation problems. Large chicks with no yolk are handling after hatch problems. Bad navels are often caused by the hatcher conditions, either too cold or too hot. Both size and defect based evaluations are used for effective diagnostics. After the field and hatchery evaluations are done, the function of the machine and environment after hatch must be evaluated. This is often done using embryo temperatures, rectal temperatures, and patterns of hatch, hatch loss, and chick quality loss.